A few months after the attack on the World Trade Center, Rudolph Giuliani, then the outgoing mayor of New York City, called for a "soaring" memorial to the people who died on 9/11. But ten years later, the newly completed memorial carries us in the opposite direction. Two massive square voids sited within the footprints of the towers, it digs down  almost as if the collapse of the towers had pounded out a space to deposit feelings about that whole wretched day. On all four sides of each void, waterfalls descend into a broad reflecting pool, irresistibly drawing your eyes, and your thoughts, ever downward. But for all that, the memorial doesn't carry you into a dark place and leave you there. By an adroit balance of elements, it manages to acknowledge the inevitability of grief at this place, but also  to some degree  dispel it. Over the past ten years there have been any number of disappointing developments at the Trade Center site (more on that later), but the memorial has not turned out to be one of them. If there's one lesson it offers, it's that there's more than one way to soar. 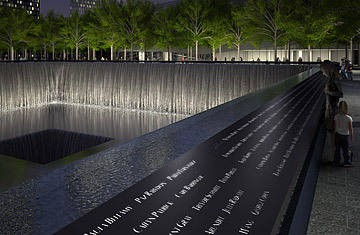 The National 9/11 Memorial, to use its formal name, is the brainchild of an architect, Michael Arad, collaborating with the landscape designer Peter Walker. When he first submitted his proposal to the memorial design competition in 2003, Arad was an unknown 34-year-old working at the New York City Housing Authority. A few months after the 9/11 attacks, he had made a drawing of an impossible idea for a memorial: two square holes that plunged through the surface of the Hudson River, so that water poured down their sides as though they were drains. Was there a way, he wondered, to translate that image into a reality on dry land? There was, but it would require a multi-year process full of setbacks, squabbles and changes to the design that began even before Arad won the competition. In his master plan for the redevelopment of Ground Zero, a scheme that had won a separate competition just a few months earlier, the architect Daniel Libeskind had proposed that the exposed foundation pit of the towers, a 70-ft.-deep concrete "bathtub" scorched by the fires of the attack, might be kept open. He saw in those walls a raw memento of that bitter day and a symbol of the strength of the city and nation. (Because that bathtub held, the Hudson River didn't come flooding into lower Manhattan.) The organizers of the memorial competition told applicants to respect Libeskind's plan, which would have placed the entire memorial plaza far below street level. To do that also meant, in effect, asking them to situate their memorials within a larger and potentially overwhelming commemorative space. Arad ignored the instruction. Though his own scheme called for pools recessed 30-ft., he envisioned them surrounded by a street-level plaza linked to the surrounding neighborhood. Arad's victory in the memorial competition meant that Libeskind's idea of preserving that wounded pit was swept away. With it went it the possibility of endowing the site with a primordial force that Arad's more cleanly manufactured voids, with their polished bronze parapets and smooth-surfaced walls, can't quite summon. But scale has a power all its own, and by its very size  each of the voids is about an acre in size  the completed memorial still evokes the immensity of 9/11. Its right-angled geometry notwithstanding, it appears before you as a vast abstract of nature, of cliffs, waterfalls and chasms. In a stiff wind, when the water whips and lashes the walls, it even has an unruliness of its own, like that restive, riderless horse in the funeral procession for John F. Kennedy. But all the while that those deep, dark voids express a sense of loss and grief  and reach into your feelings about the grave  the falling water exerts its ancient power to console. And even in this immense memorial there's an intimacy in some of the details. Because the water pours into the tanks through narrow channels spaced an inch and a half apart, it drops first in separate rivulets. As those descend they combine into a unified sheet of water, a mingling that speaks of the many lives joined by the vast event that was 9/11. Then there's a final gesture that seems designed to symbolize grief being drawn away at last. At the center of each tank the pooled waters drain into a square opening  like one of Arad's imagined holes in the surface of the Hudson  and out of sight. Arad's design originally called for ramps that would lead visitors down to galleries 30 ft. below ground. There the names of the 9/11 dead would be inscribed on walls visible behind the curtains of falling water. It might have been a profoundly beautiful effect, but for reasons of cost and crowd control, the idea was dropped. Instead the names are engraved  cut all the way through, actually, and backlit at night  on bronze panels along the parapets that form the perimeter of both voids. In all there are 2,983, including everyone (other than the terrorists) who died at the World Trade Center and the Pentagon and in the crash of United Airlines Flight 93 in Shanksville, Pa., as well as the six who died in the truck bomb attack on the Twin Towers in 1993. After much arranging and re-arranging, it's been possible to place the names of the dead close to those of friends, relatives or co-workers who also died that day. After Arad's proposal was chosen as one of eight competition finalists, the 13 jurors urged him to seek out a landscape designer to soften its hard edges. (One of Arad's strongest backers on the jury was Maya Lin, who knew an offspring of her brilliantly minimalist Vietnam Veterans Memorial when she saw one  but who probably also understood how much a bare-bones design can benefit from a green setting.) He turned to the already well-established Walker, who surrounded the voids with a six-acre park plaza of granite pavers and closely planted white oaks that will eventually grow to a height of 60 feet, forming a leafy canopy in the warm weather months. Including the park, the memorial covers just under half the 16-acre World Trade Center site, where 1 World Trade Center (formerly the Freedom Tower), Santiago Calatrava's rail station and three adjacent tall buildings are all in various stages of construction, as well the National 9/11 Museum that will open next fall. Let's be clear: the Trade Center site as a whole is a lost opportunity. It was once envisioned as a new Rockefeller Center, a great urban ensemble where low-rise theaters and cultural centers would rub shoulders with skyscrapers. It's ending up mostly as a cynical collection of office towers, a palisade of rentable space. With all the talk of consecrated ground, the memorial will be one of the few spots not consecrated to money making. For that reason alone, it was essential that it should deliver, and it does, on its promise to be both a powerful and a contemplative space. For so long as the rest of Ground Zero remains a construction site there will only be one entry point to the memorial plaza, and visitors will require advance tickets. But eventually, as the surroundings return to normal, it will be possible to enter from any of the four streets that lead to the site, and the ticketing system will end. The memorial plaza will take on its second function as an ordinary neighborhood park, a place where people will jog, sun themselves and walk their dogs, all before the backdrop of two giant, churning memory machines. Can these potent excavations and the greenery that surrounds them ever fulfill their dual mission as sacred ground and secular hangout? That's the question that will hang over this fraught site for a long time to come, to be answered on a daily basis. You might say that the final architects of the 9/11 memorial will be the people who pass through it every day. See photos of Stephane Sednaoui's 9/11 search and rescue experience. See photos of the evolution of Ground Zero.